Every spring, the Yearly Meeting ask representatives to organizations are requested to prepare a report of their activities over the prior 12 months. These reports are gathered and shared during Annual Session, and then are printed in the Yearbook for that year. The Quaker House GI Rights Hotline answers thousands of calls from active duty military, veterans, and their families. The number of calls to the hotline continues to increase. This year our Hotline counselors answered an average of 246 calls per month for a total of 2,948 calls. The counselors most rewarding yet most time consuming work is helping service members obtain conscientious objector status, guiding and providing moral support as they move through regulations, delays and at times deliberate roadblocks of the command structure. They also have been busier than ever helping service members who are being threatened with other-than-honorable discharges. They are being accused of “misconduct” or “personality disorder” when they actually suffer from PTSD, Traumatic Brain Injury, Moral Injury, and/or Military Sexual Trauma. We help them prove their medical condition so that they can receive an honorable discharge and their medical benefits. We have helped bring national attention to this problem. Quaker House also continues the important work of providing free and confidential counseling and support for the victims of military domestic violence, sexual assault, and moral injury. Our therapist, Joanna, is a valuable support for our GI Rights Hotline counselors. They have been able to refer several suicidal service members to her and know that they will be in good care. The reputation of the program has grown both in the community and on base at Fort Bragg. The service is often the last resort for those in need of help. Funding for the program is tenuous and any and all contributions are appreciated. We continue to travel to reach out to new audiences providing education and information on moral injury. We presented for a military chaplain’s retreat for the officers in the 82nd Combat Aviation Brigade, the annual Baptist Peace Fellowship conference, the Asheville, NC, VA social workers and many others. Quaker House facilitates Alternatives to Violence Project training and provides Truth in Recruiting literature and information. In addition, Quaker House provides a warm and welcoming place for people in the community to meet. Mindfulness classes and an AA group meet weekly and musicians perform house concerts frequently. We help conduct, in partnership with NOW, the Human Relations Commission, the public library, and the Cumberland County Association of Educators, regular public discussions on race relations called “Cracking the Codes: The System of Racial Inequity” and “Mirrors of Privilege.” One of these series brings together students from Fayetteville State University, a traditionally African-American university and Methodist, a traditionally white university. We advocate for teaching Conflict Resolution in the public schools. We spoke to the Cumberland County Schools social workers about the importance of conflict resolution and also recommended the use of the Cracking the Code series. Viewing the Cracking the Code DVD is now required for all school principals. We continue to witness and work against the use of torture and militarized drones. We host educational forums on many subjects that relate to peace and justice issues. Our relationship with personnel at Fort Bragg continues to grow. Through work with the military chaplains and mental health care professionals, a closer association developed which allows Quaker House to provide information and services on base and personnel at Fort Bragg make referrals to our programs. In addition, we continue to attend and present at the Bragg Region Behavioral Healthcare Collaborative, Community Blueprint (we are now on their Advisory Committee), the Behavioral Health Professionals Association, Greater Fayetteville United, and serve on the board of CARE Domestic Violence Center. 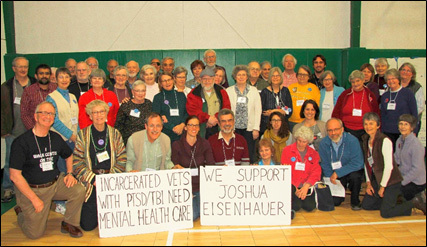 Quaker House took up the issue of the poor mental health care provided for the more than 250,000 incarcerated service members and veterans. This issue was brought to our attention by the tragic case of a service member in Fayetteville who was sentenced to 10-18 years in prison for an offense that was brought on by his severe PTSD and Traumatic Brain Injury. 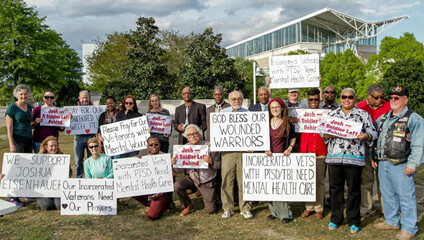 We are working with his family and lawyer to help him, and we organized a petition and a vigil calling for “Adequate and Compassionate Mental Health Care for Service Members and Veterans” nationally. The Military Chaplains Association of North America published the petition on their electronic newsletter. Our Op Ed was published in the Raleigh News and Observer and the Fayetteville Observer. In April, the vigil, in front of the Airborne and Special Operations Museum, brought veterans, VA and DoD employees, members of the Cumberland County Human Relations Commission, and Quakers together. We are continuing to work with VA and veterans’ groups to advocate for “Veterans’ Dorms” in prison, a program which is being utilized in several States. We also provide support for Bowe Bergdahl when he comes to Ft. Bragg for his hearings. His family is very appreciative of our support. We published two books this year. Help for Moral Injury: Strategies and Interventions was written by Cecilia Yocum, Ph.D. She volunteered to write the book after hearing our moral injury presentation. It is selling nationwide and even as far as England. Curt Torell, our board treasurer, wrote Conscientious Objection: Is This for You? Discerning a Claim and Documenting It with Selective Service. It, too, is reaching a wide and appreciative audience. Quaker House was featured in two QuakerSpeak videos this year. One was an interview with our GI Rights Hotline counselors, Steve Woolford and Lenore Yarger, about their work. In the other, Curt Torell discussed “How to Become a Conscientious Objector.” Both videos brought attention to the work of Quaker House. We led the November PFF/PFYM retreat, “Quaker House: Helping our Victims of War at Home," featuring our GI Rights Hotline Counselor and our domestic violence, sexual assault and moral injury counselor. The team shared personal stories of the service members and veterans that Quaker House helped over the years. Wilmington, NC, Friends School invited us to do a presentation on the ‘History and Mission of Quaker House.” The kids had many questions for us! This has been a year of awards for us! In February, we were given an award for our work to help service members and veterans from Mountaire Farms. The Fayetteville/ Cumberland Human Relations Commission presented us an award for “our activities and programs which provide positive human relations and for being actively involved in the problems of the community.” NC Peace Action gave Quaker House their 2016 Peacemaker Award. On December 4th, 2015, we participated in the annual wreath laying for Beryl Mitchell who had been killed by her military spouse. It is just one of the many ways Quaker House not only witnesses to the absurdity and cruelty of war but provides support, counseling, and care for those affected. The Quaker House GI Rights Hotline answers thousands of calls from military, active duty, and veteran and military families. The number of calls to the hotline continues to increase. This year our Hotline counselors answered an average of 280 calls per month for a total of 3,370, up from 2,659 last year. The counselors most rewarding yet most time consuming work is helping service members with their conscientious objector status, guiding and providing moral support as they move through regulations, delays and at times deliberate roadblocks of the command structure. In November, we hired Elaine Martin for a few hours each week to support the GI Rights Hotline by returning messages, screening calls and prioritizing them for urgency. Quaker House also continues the important work of providing counseling and support for the victims of military domestic violence, sexual assault, and moral injury. Started three years ago with a donation from an anonymous donor, the Quaker House counselor sees up to 10 clients one day a week. The reputation of the program has grown both in the community and on base at Fort Bragg. The service is free and often the last resort for those in need of help. Funding for the program is tenuous and any and all contributions are appreciated. We continue to travel to reach out to new audiences providing education and information on moral injury. To name a few, we gave our presentation for the Medical Grand Rounds at H.H. McGuire VA hospital in Richmond, VA; for the Licensed Professional Counselors Association of North Carolina’s annual conference; and for a military chaplain’s retreat for the officers in the 82nd Combat Aviation Brigade. Quoting Rita Nakashima-Brock, “Moral injury results when soldiers violate their core moral beliefs, and in evaluating their behavior negatively, they feel they no longer live in a reliable, meaningful world and can no longer be regarded as decent human beings.” Today, on average, 22 veterans a day commit suicide. Numerous people come up to us after the presentation to express their gratitude. Quaker House facilitates Alternatives to Violence Project training and provides Truth in Recruiting literature and information. In addition, Quaker House provides a warm and welcoming place for people in the community to meet. Mindfulness classes and an AA group meet there regularly and musicians perform house concerts frequently. Quaker House organized a forum on “Challenging Islamophobia and Racism” co-sponsored by approximately 19 other community organizations. We help conduct, in partnership with NOW, the Human Relations Commission, the public library, and the Cumberland County Association of Educators, regular public discussions on race relations called “Cracking the Codes: The System of Racial Inequity.” We advocate for Conflict Resolution in the public schools. We continue to witness against torture and drone warfare. Educational forums on many subjects that relate to peace and justice issues are conducted regularly. We have forged a relationship with Fort Bragg. Through work with the military chaplains and mental health care professionals, a closer association has developed which allows Quaker House to provide information and services on base and personnel at Fort Bragg make referrals to our programs. In addition, we continue to attend and present at the Bragg Region Behavioral Healthcare Collaborative, Community Blueprint (we are now on their Advisory Committee), the Behavioral Health Professionals Association, Greater Fayetteville United, and serve on the board of CARE Domestic Violence Center. More recently, Quaker House has taken up the issue of the poor mental health care provided for the more than 250,000 incarcerated service members and veterans. This issue was brought to our attention by the tragic case of a service member in Fayetteville who was sentenced to 10-18 years in prison for an offense that was brought on by his severe PTSD and Traumatic Brain Injury. We are working with his family and lawyer to help him, and we organized a petition and a vigil calling for “Adequate and Compassionate Mental Health Care for Service Members and Veterans” nationally. The Military Chaplains Association of North America published the petition on their electronic newsletter. Our Op Ed was published in the Raleigh News and Observer and the Fayetteville Observer. In April, the vigil, in front of the Airborne and Special Operations Museum, brought veterans, VA and DoD employees, members of the Cumberland County Human Relations Commission, and Quakers together. We are continuing to work with VA and veterans’ groups to advocate for “Veterans’ Dorms” in prison, a program which is being utilized in other States. The new website for Quaker House went live last year and continues to add resources and news of the work of Quaker House. Our Facebook page averages 1,500 “hits” a week. Moving forward, Quaker House foresees the challenge of the future; to take the Quaker House message to a wider audience, tackling the increasing administrative complexities, expanding the fund base, and succession planning as we will retire in 2017. 1. Rebuilding the GI Rights Hotline. Three years ago this nationwide service nearly collapsed due to the implosion of a key member group in its network. The Quaker House counseling staff, Steve Woolford & Lenore Yarger, played crucial roles in rescuing and restructuring the network on a more sustainable basis. This rebuilding is now virtually complete, and the Hotline is up and running again, with an active nationwide number: 1-877-447-4487, and a newly-redesigned website, http://girightshotline.org/. At the Quaker House “node” of the hotline, the busiest in the whole network, Steve and Lenore are fielding an average of 200 calls per month. The largest number of cases involve soldiers who have rejected war and are seeking Conscientious Objector status. “From our perspective as counselors,” they report, “it is a great privilege to witness the transformation that occurs in the lives of these applicants and the courage with which they confront the military culture around them. Applying for CO status can be a lonely and frightening experience. In almost every case we have worked on, we have helped our callers confront the injustice of a military system that would rather ignore conscientious objectors or bully them into compliance with military life rather than follow military rules and regulations. Without help and support many applicants would be overwhelmed by what they are up against. Many of these conscientious objectors would find themselves deployed to the front lines or running away and facing criminal charges.” For this dedicated and skilled service, Quaker House does not charge the soldiers a penny. Like all our work, it is made possible by the support of Friends and Meetings, in Baltimore YM and elsewhere. 2. Confronting the Military Industrial Complex. January 17, 2011 marked the 50th anniversary of President Dwight Eisenhower’s prophetic warning about the rise of the Military Industrial Complex: “In the councils of government, we must guard against the acquisition of unwarranted influence, whether sought or unsought, by the military-industrial complex. The potential for the disastrous rise of misplaced power exists and will persist. We must never let the weight of this combination endanger our liberties or democratic processes. We should take nothing for granted.” But this “disastrous rise” has continued apace, with militarism pervading the key structures of our society. To recall this warning and diagnose our condition in light of it, Quaker House sponsored a conference at Guilford college. Speakers and workshops analyzed some of the many ways militarism has saturated our culture, and how we might name and challenge it. A highlight was the presentation on the “Arab spring,” then just beginning, by Friend Helena Cobban from Charlottesville Meeting, who is also a distinguished foreign affairs analyst. Videos and transcripts from many of the sessions are now online at the conference website: www.micat50.net. 3. Seeking Accountability for Torture. From the failures of the White House to close Guantanamo Bay prison, to the claims that the killing of Osama Bin Laden justified torture by US forces, national events have kept the issue of torture on our front burner. There are many local connections too, as Fort Bragg and nearby facilities played key roles in the torture program of past years, and are linked to reports of continuing abuse of prisoners in secret prisons. Our witness includes producing a study pamphlet, “Patience & Determination,” and continuing monthly visits to the County Commissioners of a nearby county whose airport hosts the CIA front company responsible for "torture taxi” flights. This visitation witness is now in its third year, and has opened doors to communication which were previously locked shut. 4. Violence Within The Military. As the Epistle to the Galatians cautions, Chapter 6:7-8, “Do not be deceived: God is not mocked, for whatever one sows, that will ye also reap.” This somber forecast applies to war machines as well as individuals. And we see this verified here in our military city, and around the country, in a panoply of mayhem coming home: GI suicides outpacing battle deaths; epidemics of domestic violence; sexual assaults; and other crime by war-damaged troops. Although our role is mainly to monitor this and offer support to other efforts involved, we also feel compelled to name this unhappy harvest to keep it from being ignored and forgotten by a public which is all too easily persuaded to avoid thinking about the numerous wars the US is now involved in, and their terrible toll at home, as well as abroad. 5. Finding New Leadership. Our Director, Chuck Fager, plans to retire in November, 2012, and we are now actively seeking applications for the position. Chuck tells us this is the best, most challenging job in Quakerism, and we hope there are some in Baltimore Yearly Meeting who may feel a leading to apply to take up the work. More information about the position can be found on our website, www.quakerhouse.org, and interested persons are encouraged to contact the Clerk of our Search Committee at: betsybrinson@yahoo.com. There are other efforts we could describe, but space is limited. We close by offering our heartfelt thanks to the Friends and Meetings in Baltimore YM who have supported Quaker House as a practical expression of the Peace testimony. The economic hard times have affected us too. (Our latest audited financial statement is posted on our website.) We ask that Friends continue that support as way opens.